Stair lifts are one of those investments that can help you transform your life and restore your independence. Many of our customers have struggled for years with having to keep trips upstairs in their own home to a minimum or even having to move their bedroom and family bathroom downstairs. For them this has been a source of great stress and frustration and has rendered parts of their own home all but inaccessible to them. A stair lift, however, restores the user’s ability to move up and down stairs with ease and gives them a greater degree of independence. They can, often for the first time in several years, feel as if they occupy their entire home once more. This is all about peace of mind. Many people who have become less mobile as a part of the normal aging process worry that they might have to leave the home that they love, or at the very least they might have to make major structural changes to it. They fear losing their independence. But with the simple installation of a stair lift they can once again access all parts of their home safely and easily. A stair lift is easier to fit and less expensive than many other adaptations, but it can literally change an older person’s life. Knowing that their loved one has a stair lift and will no longer have to struggle on the stairs and risk falling gives peace of mind to your family too, particularly if you live on your own. Getting old is a normal process, as is finding that your mobility is not easy as it once was. This need not, however, mean that you cannot continue to lead a full and active life. A number of common health conditions often result in restrictions to one’s mobility. Two of the commonest amongst older people are osteoarthritis and rheumatoid arthritis, both of which cause inflammation and pain within the joints, particularly in the hips, knees, ankles and elbows. The worst of the symptoms can be controlled with pain killers and anti-inflammatory drugs, but a stair lift is a major support towards enabling you to stay mobile within your home. It can also protect your body from the damaging wear and tear of physically climbing up and down the stairs several times a day. 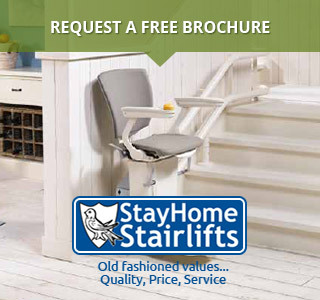 Fitting a stair lift can also make a difference for the affected person’s partner or carer. The United Kingdom currently has an estimated six million unpaid carers supporting old or infirm family members. Many of these individuals with caring responsibilities suffer accidental stresses and strains by having to give physical support to their loved one: helping them to get up and down stairs, for instance. With a stair lift the person in need of support can get upstairs independently, thereby giving a better quality of life to both the person with mobility limitations and his or her carer.